Howdy from Rafflecopter HQs and a Happy 2014! We hope the new year brings you such joy. Very resolution. Wow. But seriously, we wanted to give you a few updates from what we’ve been up to, and heck, we’ll throw in a giveaway at the bottom of the post to kick off the new year. 2013: Where Did The Year Go? Woah — the last year was a whirlwind. The company went from working out of a 3 bedroom apartment into a real office in January of 2013. That office was outgrown after 10 months, as we’ve only recently moved into our current location in the heart of downtown Boulder. Additionally, several brave souls have joined our team to help see our company’s vision of creativity, innovation, and forward thinking. Since August, we’ve gratefully welcomed our first four employees to the company: Ken, Jon, Jared, and Josh. While building a team is a very difficult and humbling process, it’s been an exciting adventure; we’re happy to have them join us for the ride (psst… we’re still hiring!). In a move that took many by surprise, Facebook changed their promotion guidelines. We soon thereafter released a new flash giveaway app as well as some improvements to our current Facebook app to adjust for the changes. Finally, we enjoyed our first sponsorship roles as a company in several events, including iRetreat, Femworking Conference, and an event here in town known as Boulder Startup Week. Playing a bigger role in the blogger & tech community is definitely new for us and it’s something we’re extremely excited about getting more involved in throughout this upcoming year. The cat is out of the bag — we’re stepping up to the plate and introducing a new product that will allow bloggers to work with brands in a new and creative way. Since starting the company almost three years ago, we’ve considered the process by which companies and brands choose to work with bloggers and other online influencers a broken process. Stay tuned for that (but sign up here to learn more here). We’ve also got some fantastic updates for Rafflecopter giveaways in the upcoming months. The amount of folks using Rafflecopter over the last year has tripled; we’re looking to build upon what’s already available. Stay tuned! Finally, we’ll be making our first conference appearance at the Build Your Blog Conference in early February. We hope this will be the first of many events we attend & hope to see you there! Let’s start of 2014 on the right foot. From now through Feb. 10th, you’ll have the chance to enter to win one of several prizes, including an Apple iPad mini, a $200 gift card to Amazon, and a handful of Rafflecopter prize packs. The rules are simple: tell us who referred you to the giveaway. That’s it. As you enter, type in your referral’s contact info (email address, twitter account, etc.). When the giveaway is over, we’ll choose one winner at random to win the iPad mini. To sweeten the deal, if you happen to refer the winner chosen for the iPad mini, you’ll walk away with a $200 Gift Card to Amazon. You’re more than welcome to embed the widget on your blog to gain more referrals. You can grab the widget’s embed code on the giveaway’s share page here. While there is no limit to the number of folks you refer to the giveaway, you can’t refer yourself and your referral must have entered the giveaway in order to count. Not chosen as the iPad mini winner? Not a problem. Five randomly chosen runner-ups will receive a Rafflecopter prize pack, which includes a 6-month business subscription, a Rafflecopter t-shirt, and a handful of stickers. Good luck! Thanks for the chance. This is really nice!! I Love this giveaway. You know I was dreaming this iPad mini. I wish I will be the winner .. This is Awsome! Thanks for letting me in. Learned about giveaway from the Rafflecopter email you sent. Thx for doing a giveaway! What a awesome way to start a new year!! Thanks for the chance to win!! I learned about this giveaway from my twitter account that I follow you on!! Thanks for the chance to win!! I learned about this giveaway via your tweets on twitter. Have a great day and tysvm! iPad like me who do not have such a chance to thank you for giving .. I received a Tweet from you is how I learned about this Raffle and Happy New Year! Congratulations on all of your success – you have earned it. I was referred to you by @Droid_Life. My favorite Android blog. I was referred to Rafflecopter itself by other mommy bloggers who are too many to name but who all love you. I have been using you guys for just over 2 years now. Mary T, @sundancesurvey on twitter Shared this with me! Giveaway Promote on Facebook !!! Easy to use – both for contestants and the giver! I love Rafflecopter! Thanks for this giveaway! It would only make sense to win an iPad mini with some futuristic rafflecopter app already installed! YOU referred me through your great e-mail! I got referred through a Rafflecopter email! I wish it was easier to share on facebook. Kindof like the twitter/tweet. Just click a button and it would share. I got referred by rafflecopter via twitter. Referred by YOU through an email! Thanks for such a generous giveaway! Referred by you from your awesome email but originally referred to raffle copter by Gisele from Xpressobooktours. You guys make giveaways so easy you rock!! I am grabbing the widget and referring everyone! Xmas dolly sent me. Great giveaway! Just had my first rafflecopter experience. And, was very pleased with it! This is amazing of you! Thank you! I would love to win because I’ve had a crashed computer for almost a year now. I’m entering on my cellphone. I was referred by Xmas Dolly (Marie C.) and I love this raffle and am your newest subscriber. Woo hoo!!! Referred by you through an email. Referred by A,M Madden through Facebook!! I would love to have our pinterest follows be connected like with twitter. 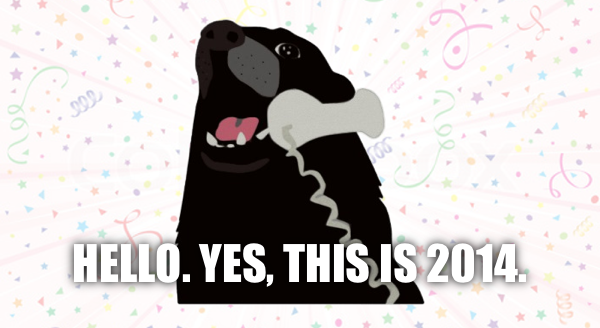 Sounds like you’re all set for a great 2014. Congratulations on your expanding team. Everyday that I come back it says, “☺ Do this again tomorrow for more entries! ☺” and I have to manually edit it and post a new tweet. Is it a glitch? I thought we could tweet more than once? i can’t login with my fb account ! pls help me! I wasn’t referred…I just found you! Could really use a win! Would be great to have so that I can spend more face time with my grandson. I was referred by Rafflecopter on Twitter. I saw the post and entered! Good luck everyone! Here’s the entry link I followed! Thank you @droid_life for introducing me to Rafflecopter! I was referred by Rafflecopter on Twitter. thankyou so much for this very great giveaway. I’d love to win. An iPad would aid me so much homeschooling my little man. Hope to win so I can use $ on apps and other tools for teaching I was going to spend on the iPad! I really like Rafflecopter. Maybe make the upgrades cheaper? I arrived here from Twitter, through a Rafflecopter twitt. My husband referred me @Roberto Mejia, thanks for the chance to win! Kwernerdesigns/Kristina Werner blog/Kristina Werner…First time learning about these types of companies for give-a-ways. Congratulations on your success Rafflecopter…I will definitely suggest this site to my boss and her companies. Oh and forgot to mention I PAD would probably be the BEST tool I could use at conducting business and running monthly meetings for my boss so she can reach out and grow the business. Thanks! That’s great to hear! Wow!!! awesome prize!! :) Love It! I love to join promo and giveaways in Facebook and I observed Facebook page and some user are using Rafflecopter to run a giveaway. I was referred by Rafflecopter on Facebook. Thanks for the opportunity! Rafflecopter has awesome giveaways. So excited to finally meet you, Greg! Learning new ways to use Rafflecopter to help build my business. Thanks! It would be nice to win, but I will still love Rafflecopter. Dont mind if i do. Rafflecopter makes it very simple for me to enter contests & sometimes I win things! Your Twitter feed since I follow Rafflecopter on Twitter! Thanks! I was referred to this giveaway by the twitter page of Rafflecopter!! Congratulations to all of the winners.. I was referred to your page by pandacashback.com contest. As a newsletter subcriber, Rafflecopter referred me to enter and win.